Keauhou Shopping Center features a nice blend of shops, restaurants, professional services and nice views of Keauhou Bay. The open-air mall is located just minutes south of Kailua-Kona in the Keauhou Resort. Every Saturday there is the Keauhou Farmers Market where you can listen to music while you shop for fruits, vegetables, coffee, flowers and more from 25 Big Island farmers. It is located in the parking lot across from Keauhou Cinemas. For clothing and accessories, check out Paradise Found Boutique and Pineapples. For gifts, try Clint Sloan Galleries, In the Tropics and Showcase Gallery. You will also find KTA Pharmacy, KTA Super Stores and Longs Drugs. When you are ready to grab a bite, your options include Drysdale's Two Restaurants, Kenichi Pacific, Kona Natural Foods II, L & L Drive Inn, Los Habaneros, Peaberry & Galette, Rocky's Pizza and Royal Thai Cafe. For entertainment, Keauhou Cinemas features a multiplex theater with stadium seating. 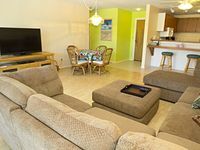 Great golf course location, one bedroom one bath condo with ocean view, Keauhou Resort #114, In Keauhou. 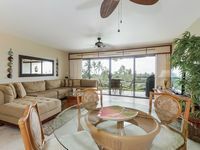 Garden view, 2 bedroom, 2 bath condo, golf nearby, Keauhou Punahele D103, In Keauhou. 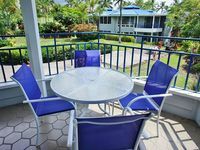 Spacious 2 bedroom, 2 bath condo, golf nearby and partial ocean view, Keauhou Punahele B106, In Keauhou. Nice shopping center. Always stay in a condo in that area. Drysdale's is friendly, fun, and has a great shrimp basket with fries. Rocky's pizza is so good, went there twice on our last visit. 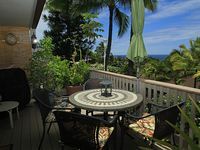 Love the island of Hawaii, and love your location area.